Please note the dimensions stated for this product (12.5 x 14 x 11) are incorrect. The actual dimensions of this stool are 14″ long, 8.5″ wide and 6.5″ tall. Unfortunately, this is simply not tall enough for our purposes. To its credit, the stool is cute and very sturdy with nice non-slip surfaces on the top and bottom. I purchased this stool as a replacement for the BabyBjorn stool that I originally bought (on amazon) for my son BABYBJÖRN Safe Step, White. Unlike the BabyBjorn stool, this stool is not easily flipped over when my kid stands just on the edge on the stool. The surface area is a little bit smaller than the Bjorn, but is still wide enough to provide plenty of support with getting in and out of bed, up to the sink, or up to the toilet. I think it looks good too. One downside is that is comes with stickers (safety and product info) that are difficult to remove. I’m pleased with this little step stool. It is durable plastic, brightly colored and has no slip rubbler/plastic on the bottom. Contrary to the maufacturers suggestions not to use as booster seat…it works fine as a booster seat on a chair with arms. Pro with us: it matches my 2-1/2 year olds frog potty chair & toilet seat. Con with me: wish they didn’t put “super stuck” labels all over one side of the stool…tried to remove them and scratched the plastic. 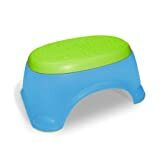 Overall good inexpensive step stool for little ones.